This post is Part Three of our New Year, New Schedule series. Catch up with Part One and Part Two. Making the switch to a new scheduling solution may seem just as daunting as the challenges you faced that led you here, but with a capable support team on hand, the transition will be well worth the time spent learning the software. 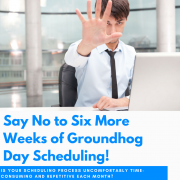 We’ve outlined the basic steps for implementing new scheduling software, so you’ll know what to expect once you make the leap. Keep in mind that these will vary depending on the particular service you’ve chosen. Whether you’re still researching your options or already preparing to set up a scheduling solution that you’ve chosen in that process, your goals should be outlined as clearly as possible. Find out if consultancy services are available for you as a new client. 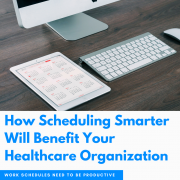 If so, arrange to meet with a consultant, either over the phone or in person, to sort and confirm your organization’s goals and what they’ll mean for your scheduling process once you begin using the software. Everyone involved–both your organization and the support team–wants this step to move quickly and efficiently. Depending on the situation, your IT department may need to participate here. Ideally, though, this area of the implementation can be done remotely with an internet connection and the support team leading it. This way, the transition is easier for you to handle, and the technical side can remain in the hands of the experts. Once the support team finishes the configuration, it will be time for you to learn how to use the software. This step is the most important in terms of your adjustment, because you need to know your way around the software in order to smoothly transition your organization to this new method. Ask as many questions as you need to during the training sessions, and reach out to the support team with any additional questions or concerns that arise afterwards. You won’t absorb every detail immediately at the training sessions and shouldn’t expect to, but you also want to optimize your one-on-one time with the support team. 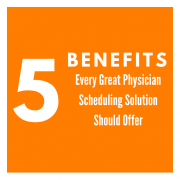 The software ultimately needs to provide a valuable return on investment by allowing you to create fair schedules for your providers, who can then focus on improving and maintaining a high quality of patient care. So, if extra training sessions are available, they may be worth the expense in the long run. If your organization is a large one, a day or two of on-site training and onboarding may be the best route for you. On-site would require more time and resources, however the thoroughness and personalization involved can’t be matched by a training session conducted over the phone. If you don’t typically pick up new software skills quickly, on-site training would also be most beneficial for you. Face-to-face meetings benefit the support team too; they become more familiar with your organization, allowing them to better assist you in the future. Once you’ve been fully trained in the software, you’re ready to test it out. Although the impact won’t be immediate, one of the first changes you may notice is less time spent building the schedule each month. From there, you’ll know you’ve made the right decision when you receive fewer complaints about assignments and you have more time for your other responsibilities. 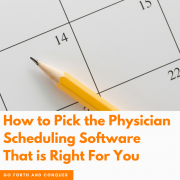 To get a better perspective on how your scheduling process has improved with the new software, refer to the original goals (and your checklist!) and analyze whether or not you’re facing the same challenges that you once were. 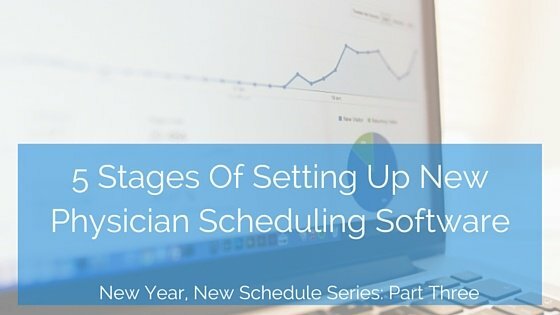 What has your experience been like with implementing scheduling software? Share with us in the comments.